All of the graphics below are available on our standard range of Men's Classic T-Shirts, but you can use them to design your own product. Maybe you would like a mug or a hoodie with one of these pictures and a name? Simply go to "DESIGN MY OWN". All you need to do is choose your product, then choose a one of these graphic from the Birthday Designs and then add your own custom text. This range is ideal for the modern superbike rider. 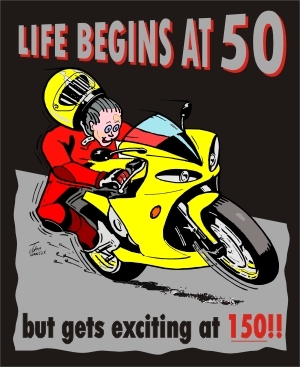 The cartoon is drawn for biker t-shirts by John Hancox and captures the excitement and fear of speed. 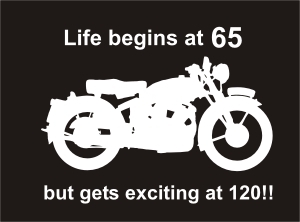 One of our top sellers and sure to bring a smile to any biker's face. 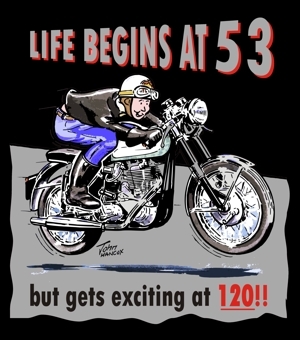 Again, the cartoon is drawn by John Hancox and captures a rider on a BSA Gold Star classic motorcycle with the front wheel aloft. 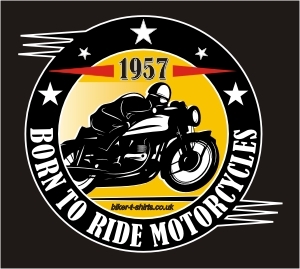 A great t-shirt for classic bike enthusiasts. 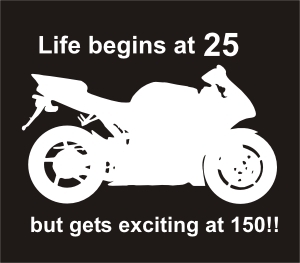 A firm favorite with bikers, a simple silhouette of a modern superbike with "Life begins at..." "and gets exciting at 150!!" It sure does!! A great present for a classic bike enthusiast .....simple and classic!! One of our first designs and looks very effective on a t-shirt. 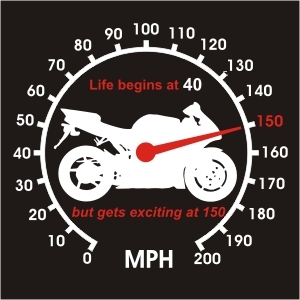 As above, but one for the classic bike lads. 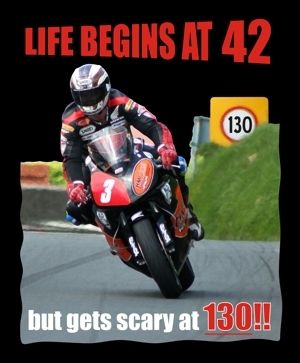 If only I could lap the Isle of Man at 130mph, now that would be scary!! 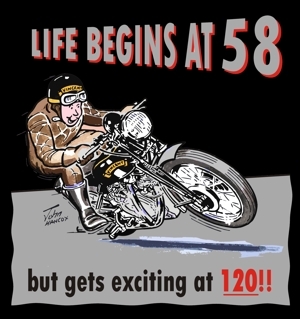 Another cartoon by John Hancox and capturing a rider on a Vincent classic motorcycle with the front wheel aloft. 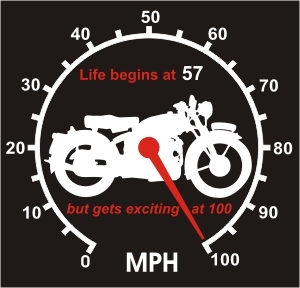 A great t-shirt for a classic bike enthusiast. 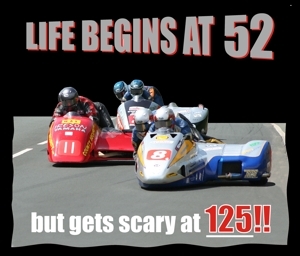 Close encounters of the third wheel kind on this "Life begins at" t-shirt for sidecar racers and enthusiasts. 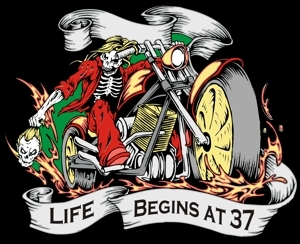 Life begins at .... but don't let the Grim Reaper get you yet!! 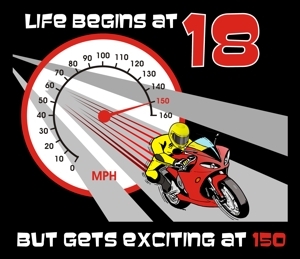 One of the latest additions to our range - Superbike and speedo. We thought this one should be at the bottom of the page. 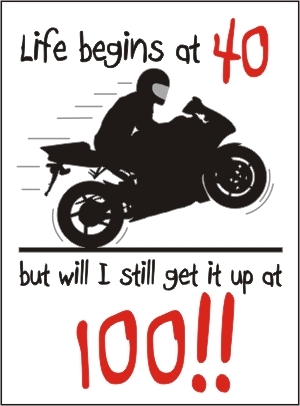 I'm 53 and I can't get it up any more, but that's due to the weight of my GSXR1100.